Edit will give you the option to add/change/remove any fields in the form. Delete will delete the entire form. Disable will just stop the form from working. 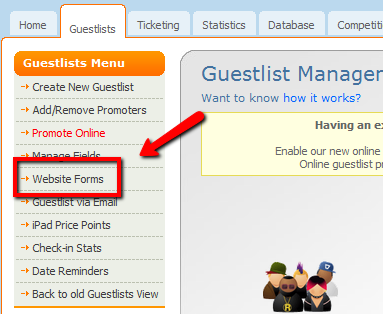 Dates is where you can set date restrictions such as restrict the years of creation, the maximum date to when a Guestlist can be created and days of the week that a patron can make a Guestlist. This includes public holidays, special closing dates and how far ahead they can make Guestlist booking. Code is the snippet of code you need to have the form on your website. Rules is used to specify the categories that contacts can be assigned to, and also any email verification options that you would like. Notifications are the email you recieve as well as automated welcome messages. Submissions is where you can view your statistics about the forms performance.